The Lower and Upper Bound Theory provides a way to find the lowest complexity algorithm to solve a problem. Before understanding the theory, first lets have a brief look on what actually Lower and Upper bounds are. Let L(n) be the running time of an algorithm A(say), then g(n) is the Lower Bound of A if there exist two constants C and N such that L(n) <= C*g(n) for n > N. Lower bound of an algorithm is shown by the asymptotic notation called Big Omega (or just Omega). Let U(n) be the running time of an algorithm A(say), then g(n) is the Upper Bound of A if there exist two constants C and N such that U(n) >= C*g(n) for n > N. Upper bound of an algorithm is shown by the asymptotic notation called Big Oh(O) (or just Oh). According to the lower bound theory, for a lower bound L(n) of an algorithm, it is not possible to have any other algorithm (for a common problem) whose time complexity is less than L(n) for random input. Also every algorithm must take at least L(n) time in worst case. Note that L(n) here is the minimum of all the possible algorithm, of maximum complexity. The Lower Bound is a very important for any algorithm. Once we calculated it, then we can compare it with the actual complexity of the algorithm and if their order are same then we can declare our algorithm as optimal. 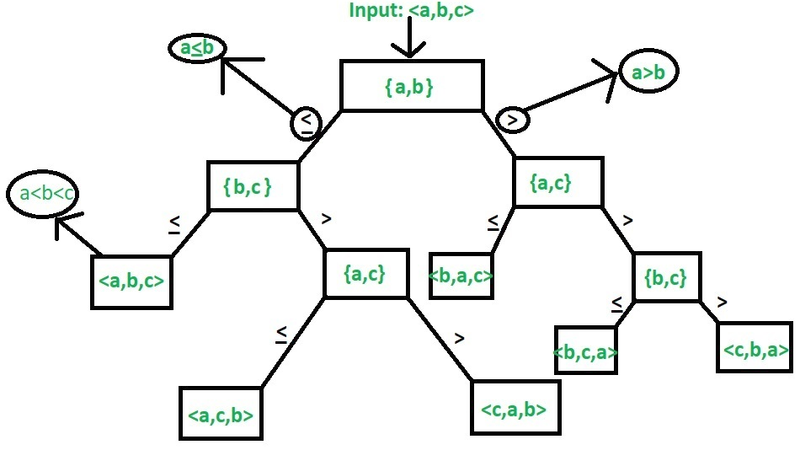 So in this section we will be discussing about techniques for finding the lower bound of an algorithm. Note that our main motive is to get an optimal algorithm, which is the one having its Upper Bound Same as its Lower Bound (U(n)=L(n)). Merge Sort is a common example of an optimal algorithm. It is the easiest method to find the lower bound. The Lower bounds which can be easily observed on the basis of the number of input taken and the number of output produces are called Trivial Lower Bound. In the above example its easily predictable that the lower bound is O(n2). The method is for all those algorithms that are comparison based. For example in sorting we have to compare the elements of the list among themselves and then sort them accordingly. Similar is the case with searching and thus we can implement the same in this case. Now we will look at some examples to understand its usage. It is a type of searching in which the list is already sorted. In linear search we compare the key with first element if it does not match we compare with second element and so on till we check against the nth element. Else we will end up with a failure. In binary search, we check the middle element against the key, if it is greater we search the first half else we check the second half and repeat the same process. Calculating the lower bound: The max no of comparisons are n. Let there be k levels in the tree. Thus the lower bound of any comparison based search from a list of n elements cannot be less than log(n). Therefore we can say that Binary Search is optimal as its complexity is Θ(log n). 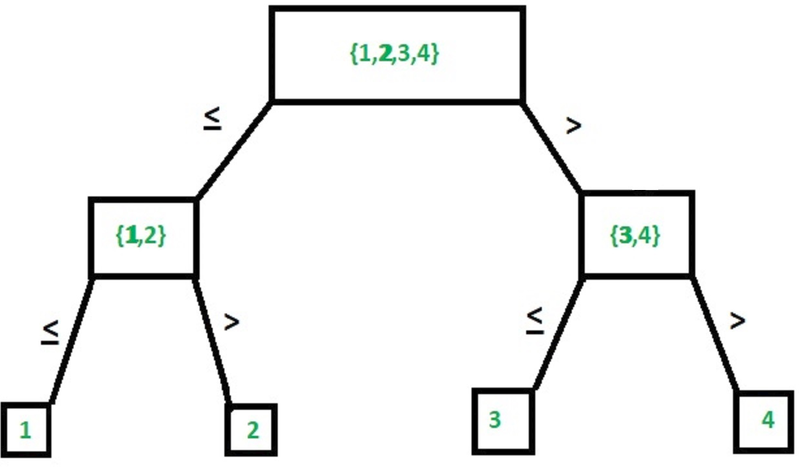 The diagram below is an example of tree formed in sorting combinations with 3 elements. Example – For n elements, finding lower bound using computation model. For n elements we have a total on n! combinations (leaf nodes). (Refer the diagram the total combinations are 3! or 6) also it is clear that the tree formed is a binary tree. Each level in the diagram indicates a comparison. Let there be k levels => 2k is the total number of leaf nodes in a full binary tree thus in this case we have n!≤2k. As the k in the above example is the no of comparisons thus by computational model lower bond = k.
Problems related to algebra like solving equations inequalities etc., comes under algebraic problems. For example, solving equation ax2+bx+c with simple programming. Complexity for solving here is 4 (excluding the returning). The above example shows us a simple way to solve an equation for 2 degree polynomial i.e., 4 thus for nth degree polynomial we will have complexity of O(n2). Let us demonstrate via an algorithm. Example: anxn+an-1xn-1+an-2xn-2+…+a1x+a0 is a polynomial of degree n.
Now to find an optimal algorithm we need to find the lower bound here (as per lower bound theory). As per Lower Bound Theory, The optimal algorithm to solve the above problem is the one having complexity O(n). Lets prove this theorem using lower bounds. Proof: The best solution for reducing the algo is to make this problem less complex by dividing the polynomial into several straight line problems. Clearly, the complexity of this code is O(n). This way of solving such equations is called Horner’s method. Here is were lower bound theory works and give the optimum algorithm’s complexity as O(n). According to the upper bound theory, for an upper bound U(n) of an algorithm, we can always solve the problem in at most U(n) time.Time taken by a known algorithm to solve a problem with worse case input gives us the upper bound.